Tiananmen Square, 2006 National Day of the PRC. The placard reads "Warmly celebrate the 57th anniversary of the founding of the People's Republic of China". The portrait is that of Sun Yat-sen. The PRC (People's Republic of China) was founded on October 1, 1949, with a ceremony celebrating the forming of the Central People's Government taking place in Tiananmen Square on the same day that year. The Central People's Government passed the Resolution on the National Day of the People's Republic of China on December 2, 1949, and declared that October 1 is the National Day. The National Day marks the start of the only Golden Weeks in the PRC that the government has kept. Removing one of the Golden Weeks caused controversies when it happened in 2007. ^ China at 60: Nostalgia and progress | Fu Ying | Comment is free. The Guardian (2008-07-16). Retrieved on 2011-04-30. ^ Flag-raising ceremony held for China's National Day celebration_English_Xinhua. News.xinhuanet.com (2009-10-01). Retrieved on 2011-04-30. ^ "China National Day: October 1st, Golden Week". www.travelchinaguide.com. ^ National Day celebrated across China _English_Xinhua. News.xinhuanet.com (2009-10-01). Retrieved on 2011-04-30. 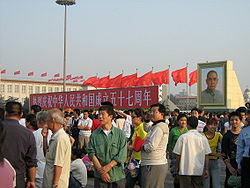 ^ Fri, Oct 02, 2009 – China celebrates with elaborate display of power and ideology. The Irish Times (2009-10-10). Retrieved on 2011-04-30. This page was last edited on 30 December 2018, at 01:19 (UTC).